This is a rendering of the new Sheltair Aviation hangar to be built at Republic Airport in East Farmingdale. Groundbreaking for the $55 million project is slated for later this year. 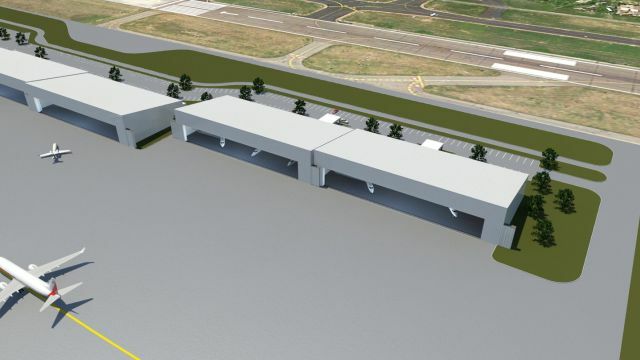 One of Republic Airport’s most prominent tenants is expanding its footprint, with plans to break ground late this year on a 210,000-square-foot hangar. 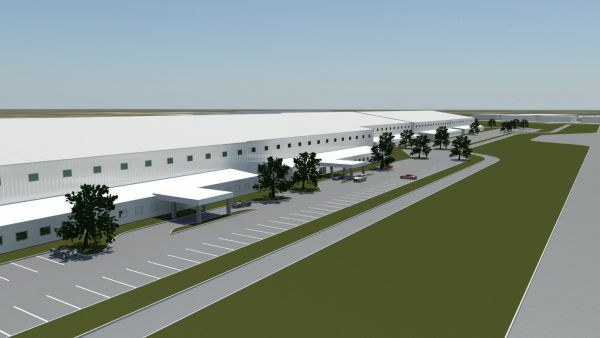 Sheltair Aviation, an aviation development company with locations at 22 airports in Florida, Georgia and New York, said it has chosen BDG Construction and AECOM to design and build the $55 million hangar. Sheltair is one of three fixed-base operators at Republic in East Farmingdale, providing fueling services and hangar space for private planes. Requests for hangar space have surged since state lawmakers approved tax exemptions for sales and use of general aviation aircraft, said Todd Anderson, Sheltair’s vice president for real estate and development. New Yorkers would often buy and base their planes in surrounding states because it was less expensive, he said. Rendering of the new 210,000-square-foot hangar, a $55 million-dollar project with groundbreaking scheduled for October 2016. Sheltair Aviation said it has chosen BDG Construction and AECOM to design and build the hangar at Republic Airport in East Farmingdale. “What we’re seeing now is a big spike in the number of inquiries for people looking for hangar space, but more importantly, it’s really done . . . an excellent job in terms of leveling the playing field between New York and other bordering states,” Anderson said. The planned hangar, considerably larger than Sheltair’s current 66,000-square-foot space, is needed to accommodate corporate jets “whose fuel-efficient designs and overall size require higher and wider facilities,” the company said in a statement. The facility will feature a new terminal for the company’s fixed-base operation, as well as 42,000 square feet of office and shop space, said Karen Kroeppel, director of sales and marketing for Sheltair. The company also has locations at Long Island MacArthur Airport in Ronkonkoma and Francis S. Gabreski Airport in Westhampton Beach. From private general aviation planes to corporate jets, “not only do they need a place to land and get fuel and services when they’re out, but they need a place to stay,” Kroeppel said. Authorities are investigating the presence of a drone in the vicinity of Republic Airport on Sunday morning. The pilot of a Piper PA-28 aircraft reported seeing an unmanned aircraft operating at an altitude of 2,000 feet 6 miles north of the airport in East Farmingdale in Suffolk County about 8:20 a.m., said Jim Peters, a spokesman for the Federal Aviation Administration. The Piper aircraft was approaching to land at the airport at the time of the drone sighting, Peters said. 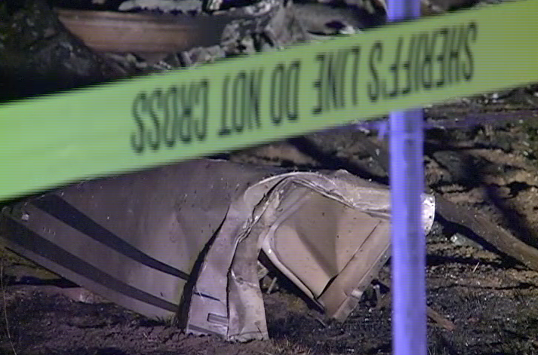 The Federal Aviation Administration said it notified the Suffolk County Police Department. The Federal Aviation Administration prohibits drones from flying higher than 400 feet near airports and mandates that drone users contact nearby airport operators or air traffic control facilities if they plan to fly within 5 miles of an airport. A police department spokesman said Sunday afternoon that they could not immediately comment. An airport representative could not be reached. With many positions open at more than a dozen airports around the state, the Transportation Security Administration says finding new hires is particularly challenging in Alaska. A slew of factors make finding and keeping employees tough -- from rural locations of airports to a high cost of living to other, more lucrative summertime work. Skewed perceptions of what Alaska is like thanks to reality TV shows also play a part. As of Jan. 28, the TSA had vacancies at airports across the state, including Fairbanks, Anchorage, Cordova, Kodiak, Adak, Bethel, Nome, Kotzebue, Barrow, Juneau, Wrangell, Ketchikan, Petersburg, Sitka and Yakutat. Although the federal government’s official jobs site lists 21 TSA officer positions available in Alaska, it’s not necessarily an accurate reflection of the TSA’s current needs. Summer is months away, but the agency is already thinking about hiring for Alaska’s busiest travel season, Dankers said. “I will tell you, based on what I’ve seen, it’s much higher than that,” she said of the 21 number. Tourism, and therefore airline traffic, has increased in some parts of Alaska in recent years, but Duffy says the TSA has "been relatively stable as far as where our presence is." The TSA has its National Deployment Force to send officers to places “that require a greater number of security personnel than is available,” according to a TSA fact sheet. They rotate in and out of airports on an as-needed basis. Eliot Freeburg -- now a security training instructor -- is a former member of the National Deployment Force and worked several couple-month stints around the state. “For me, the shorter list is where I haven’t worked in Alaska,” said Freeburg, recalling his sticker shock at the price of groceries in the Bush and what 60 below zero felt like in Kotzebue. From fiscal years 2010 to 2015, the TSA has used the National Deployment Force to supplement security at airports across Alaska at an average cost of $4.1 million a year, the TSA fact sheet says. Dankers said she was not able to provide details on how many NDF officers are in Alaska. She says those officers are paid a standard salary that does not change based on where they work. "The additional costs to have NDF officers present at an airport come from travel expenses that include transportation, housing and per diem," Dankers said in an email. Ultimately, the hope is that Alaska doesn’t need to rely on temporary officers. The TSA says it’s making a serious effort to attract potential candidates into becoming employees, such as bumping up pay to take Alaska’s cost of living into account. Coupled with retention pay -- a facet unique to Alaska for the TSA -- “an entry level officer’s starting salary can reach $50,000 or more,” the fact sheet says. Offering full-time work right off the bat is another tactic the TSA is trying. “Basically, in the Lower 48, every airport hires part-time only. And then once you’re with the agency, there’s an opportunity to go full-time. In Alaska, we’re actually hiring full time,” Duffy said. Dankers adds that veterans may feel comfortable working for the TSA as 20 percent of TSA officers in Alaska are military veterans. Then there’s the TSA ambassadors -- “the face of the agency,” Duffy said. Still, the job requirements may be a deterrent for people who would otherwise be interested. You have to be in decent shape, you can't have a felony and you can't owe the government a lot of money. "It's not an easy job, but it's an important job," Duffy said. WHITEWRIGHT, Texas -- A Dallas man is in critical condition after a skydiving accident Sunday afternoon. 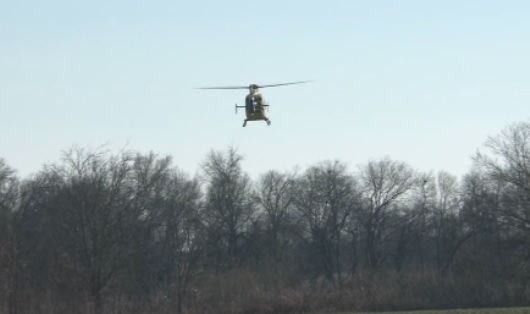 First responders tell us a 54-year-old Dallas man's parachute only partially opened, and he landed in a field just north of Bartley road in Fannin County. He was flown to Plano Medical Center in critical condition. Skydive Dallas says he had 13 years of experience and had jumped 650 times. 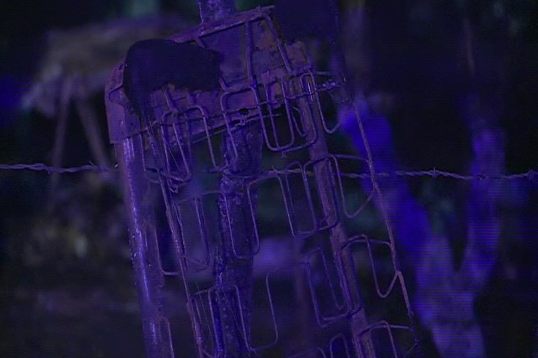 The Fannin County Sheriff's Office is investigating the accident. The man's name has not been released. 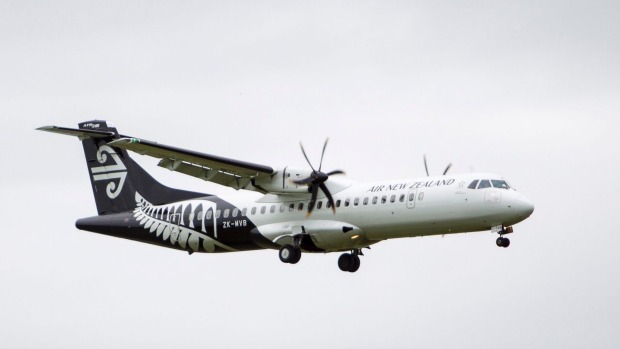 Air New Zealand is investing $25 million in advanced flight technology for its ATR fleet which should reduce weather delays for passengers. The national carrier is partnering with aircraft manufacturer ATR to equip its 68-seat ATR turboprop fleet with Required Navigation Performance (RNP AR) technology. RNP AR enables specially trained pilots to fly to lower altitudes with a more precise and efficient route to an airport, saving fuel and helping reduce the impact of bad weather on services. The airline announced late last year it was buying 15 new ATR72-600 aircraft for its regional services. Four would allow for further growth on regional routes and 11 would replace its ATR72-500 fleet, bringing its ATR fleet to 29 aircraft. Air New Zealand chief flight operations and safety officer captain David Morgan said the technology investment would benefit customers. "This technology will enable us to provide a more consistent service for customers who travel on our ATR aircraft where weather conditions can at times prove challenging for our turboprop operations, particularly over the winter months," Morgan said. ATR vice president of contracts Fabrice Vautier said Air New Zealand would be the first ATR operator in the world to use the advanced RNP AR capability. Pending certification and regulatory approval the first ATR aircraft fitted with the technology was expected to begin operations in 2018. Meanwhile on Thursday it was announced Jodie King would join the Air New Zealand executive team on February 29 as chief people officer. King takes over from Lorraine Murphy who is leaving the airline to work at National Australia Bank in Melbourne. King joined Air New Zealand in 2013 after spending 15 years in the United Kingdom with KPMG where she worked in leadership and consultancy roles with companies like London Underground, BP, EasyJet, Royal Bank of Scotland and Diageo. Prior to KPMG she worked for New Zealand Treasury and NZ Dairy Co-operative. Europe and the United States tried to bridge differences over emissions standards for aircraft on Sunday as global aviation leaders prepared to adopt new rules that could affect Boeing Co and Airbus Group's production of the largest jetliners and freighters. Proposals being debated in Montreal by the International Civil Aviation Organization (ICAO), the United Nations' aviation agency, would force makers of the world's largest passenger jets to upgrade or stop producing certain models as early as 2023, according to sources close to the negotiations and documents seen by Reuters. U.S. and European negotiators are trying to come up with the world's first carbon dioxide emissions standards for aircraft as part of the industry's contribution to efforts to combat climate change. Aviation was not included in the global climate deal agreed by a UN conference in Paris in December, but ICAO is trying to nail down the first of its two-part strategy as soon as Monday after six years of talks. It is due to finalize a market-based mechanism for all airlines later this year. Differences remain on where to place the bar on efficiency, with the United States and Canada pushing for more stringent targets than the European Union, while environmental groups have accused Europe of dragging its feet. "The CO2 standard will push industry to be as fuel-efficient as possible in all market conditions to reduce GHG (greenhouse gas) emissions and the impact of aviation on climate change,” stated the Canadian paper presented at ICAO last week. The proposals could revive pressure on European planemaker Airbus to upgrade the world's largest passenger jet, the A380 superjumbo, with new engines. Airbus recently examined that proposal to boost sales, but it has dropped down its list of priorities. It could also spell the end for Boeing's struggling 747-8 passenger jet and freighter and force the U.S. planemaker to upgrade at least one of its two smaller freighters. Airbus and Boeing declined to comment on negotiations. The Montreal talks, which run until Feb. 12, are designed to set ambitious rules for new types of aircraft in the future. A less stringent standard would apply to aircraft already in production, but this has led to the fiercest arguments since some of these planes would need to have costly improvements. The fuel efficiency standards would apply to smaller business and regional jets, along with larger commercial planes weighing at least 60 tonnes that account for the majority of aviation sector emissions, two sources familiar with the matter said. The rules for in-production aircraft would come into effect by 2023, but could also be phased in over a five-year period until 2028, one source said. The tougher standard for new designs could go into effect by 2020. Participants have been weighing 10 different options for new targets, with one being the weakest and 10 requiring the greatest reduction in emissions, the documents seen by Reuters showed. European representatives have said they will not back a standard higher than 6 on large planes in production. The United States and Canada had initially backed options 8 and 9 but said they would not budge below a 7, and at one stage did not rule out breaking off talks, the sources said. However, on Sunday some progress was reported in narrowing differences. Tougher standards have higher cost implications for planemakers. While Airbus and Boeing have already planned more fuel-efficient upgrades to most of their programs, including the popular A320 and B737, some jets would have to be upgraded or cease being produced by as early as 2023. "They're not content," one delegate said of the jetmakers. A question mark remained over the current-generation wide-body jets produced by Airbus and Boeing, the A330 and 777-300ER. Both are likely to be superseded by new models before 2023, but aviation analysts have said recent market experience and low oil prices suggest demand for older jets can be resilient. Environmental groups said the standard will boost efficiency, but it will only make a small dent on the industry’s greenhouse gas emissions, which are projected to triple or quadruple from current levels by 2040. They say the standard needs to be accompanied by a strong global market-based approach. The pilot of a light plane that crashed in Coffs Harbour last year unsuccessfully tried to do an aerobatic maneuver, the Australian Transport Safety Bureau (ATSB) has found. 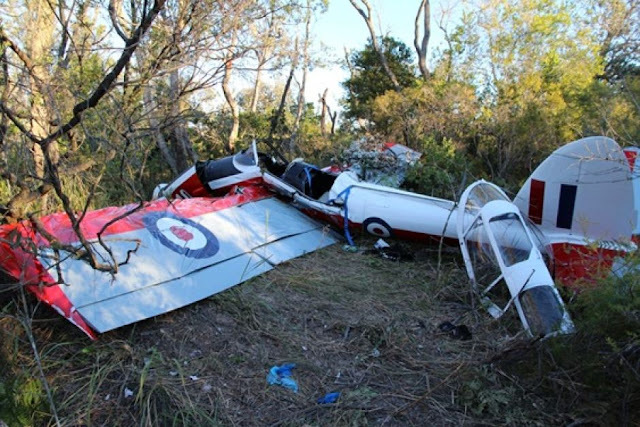 The ATSB report said the crash happened during a brief, private flight over the Coffs Harbour Regional Airport on the morning of June 29, 2014. The two-seater de Havilland Chipmunk stalled at the top of a loop, rolled, then spun out of control and crashed. 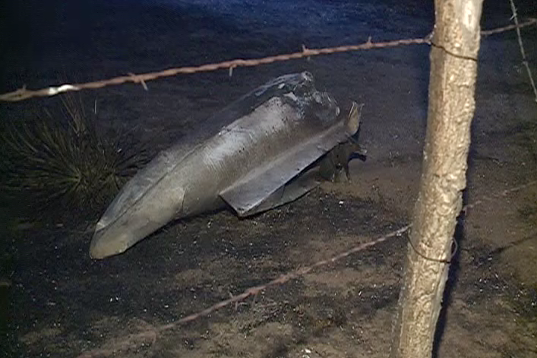 The pilot and single passenger were seriously injured. Investigators could not find any record the pilot had trained for such a manoeuvre. They also found flaws in the flying school's training material and instruction. The ATSB report also said the flying school had now made changes to its aerobatics instruction. 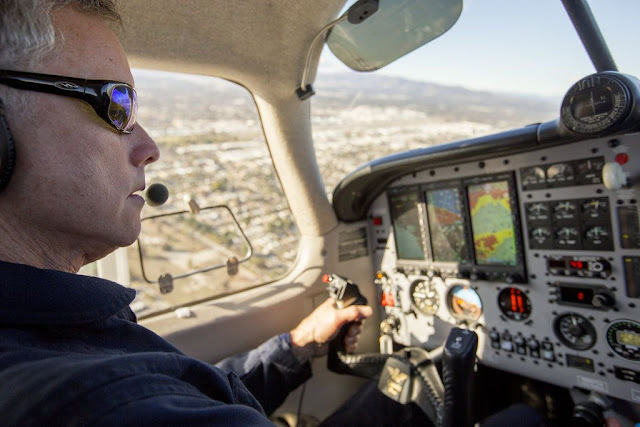 Pilot and UC Davis atmospheric scientist Stephen Conley flies toward the Aliso Canyon natural gas storage facility to measure the methane emissions from a leak. Once a week since the beginning of November, when skies are clear with northern winds, Stephen Conley revs up a small, single-engine airplane and takes to the sky out of a hangar in Placer County. The white and blue aircraft is equipped with a set of tubes along its underbelly and a backseat full of computing equipment but otherwise appears as an ordinary, albeit speedy, two-passenger plane. It’s not until about two hours into his trek, over an area of Southern California, when Conley takes a turn toward the unusual: He switches to pollution-detection mode and begins sweeping the plane in and out of a giant, invisible plume of methane gas at gradually higher altitudes until the plane reaches the top. His purpose is to monitor and measure the amount of methane coming from the Aliso Canyon natural gas leak, which started spewing methane-heavy natural gas in October, displacing thousands of residents from upscale, gated communities in the Porter Ranch neighborhood of northern Los Angeles. Gov. Jerry Brown has declared a state of emergency in the area for what is now being called the largest recorded leak of natural gas in California history. The methane leak, first reported Oct. 23, has gradually slowed within the past few weeks. However, the state of emergency — with thousands displaced — remains in place as the gas company, SoCalGas, continues its attempt to plug the hole in the deep underground pipe suspected to be responsible for the leak. 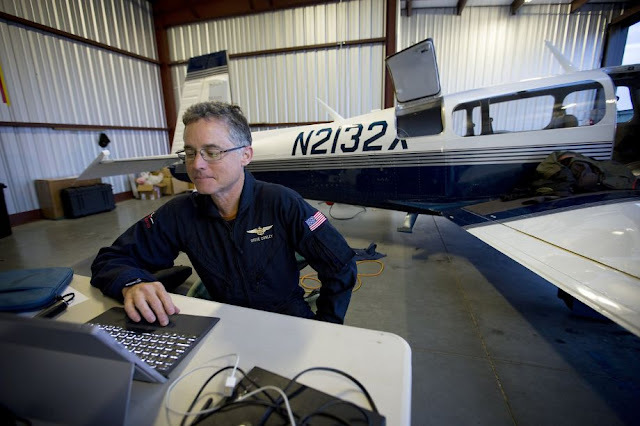 Conley, a UC Davis atmospheric scientist and owner of the aerial survey company Scientific Aviation, was contracted for the flyovers by the California Energy Commission, which was looking to track the amount of greenhouse gas emissions expelled into the atmosphere by the leak. Through his flyovers, Conley has recorded about 1,200 tons of leaked methane per day — equal to about 100,000 pounds per hour. To date, he estimates the leak has emitted 80,000 tons of methane — roughly equal to the weight of an aircraft carrier. Methane gas is flammable, and an additive in the natural gas gives it a rotten egg-like smell that some Porter Ranch residents complained made them nauseated or gave them headaches or nose bleeds. Authorities gave the residents a choice to evacuate or stay, and roughly 3,000 of them elected to leave. Those who evacuated are allowed to return as they please, but officials say most have told them they will wait until the leak is plugged and methane and other gases have time to mix into the atmosphere and move out of the area. The extent of the methane emissions wasn’t known until Conley took his first flight, two weeks after the start of the leak, to get a handle of its scale and impact. Pilot and UC Davis atmospheric scientist Stephen Conley provided the first data on the methane gas leak in Los Angeles. The energy commission solicited him for the first two flyovers, he said, because his plane was one of a few throughout the state capable of running such tests, and he was already working with the organization on a separate research project. He has subsequently conducted regular weekly flyovers for the California Air Resources Board, which took over the project from the energy commission with funding from SoCalGas. Conley said taking measurements from the air is necessary because testing from the ground would be difficult, complex and time consuming. Conley’s plane pulls in the gas through the set of uptake tubes that test for gases such as carbon dioxide and methane. It measures the amount of each gas and the wind velocity at the time, and from that information he can calculate methane concentrations. Conley — who usually flies alone, but has brought an occasional guest — was the only scientist cleared to perform the mission initially, but said NASA’s Jet Propulsion Laboratory sent a specially equipped air vehicle into the plume last month to measure the gas. Methane is a special concern as a greenhouse gas because it is about 25 times more powerful than carbon dioxide, said Dave Clegern, spokesman for the California Air Resources Board. “We want to know how much has been emitted so we know how we can best deal with this once it is done,” he said. And, Conley noted, a leak such as this is significant to people around the world, whether they realize it or not. Officials from SoCalGas have promised to fix the leak by March, saying it will take time to locate and plug the responsible pipe. In Washington, California Sens. Barbara Boxer and Dianne Feinstein have written an amendment to an energy bill being considered in the Senate that calls for the Energy Department to review the situation and recommend any immediate steps the federal government might take to assist in solving the leak and in preventing and responding to future similar leaks. Meanwhile, Conley said each additional flyover has found lower levels of methane, but there are not yet any plans to stop his flyover measurements until the leak is fixed. And while he has enjoyed having a part in the project, he said the need remains for a formalized plan to respond to leaks like this in the future. “For a country so concerned with greenhouse gas emissions, how can we not have something in place to measure these events when they do occur?” Conley said. New Delhi: Air India pilots have sounded a warning over the almost 25-year-old Airbus 320s the airline is still using and warned of a 'disaster'. The airline, on its part, maintains that these 'classics' are perfectly safe to fly and plans to use them for two to three more years. In the past too ICPA has several times written to the airline and the DGCA on the issue of using the A320 classics that IA started inducting in late 1980 to early 1990s as they are prone to snags. However, the regulator has refused to act so far. A senior AI official dismissed safety fears over using these old planes and says that they will be used for up to three more years. "We were having problems with weather radars and have ordered them. The Boeing 747s used to fly VVIPs (read president, vice-president and prime minister) are even older. But there is no issue with their safety," the official said. 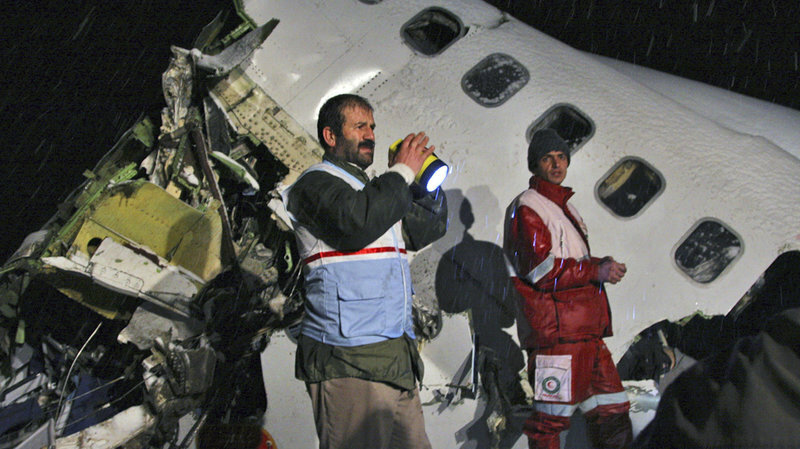 Rescue workers look through the wreckage of an Iran Air Boeing 727 plane that crashed in northwest Iran as it was making an emergency landing in 2011. More than 70 of the 106 on board were killed. Iran's aging airline fleet has had a poor safety record. Iran and Boeing go way back. Boeing was the largest supplier of civilian aircraft to Iran before the country's 1979 Islamic revolution. And despite the fraught relations between the U.S. and Iran since then, Iran has kept flying those planes for decades. But don't expect any deals anytime soon. 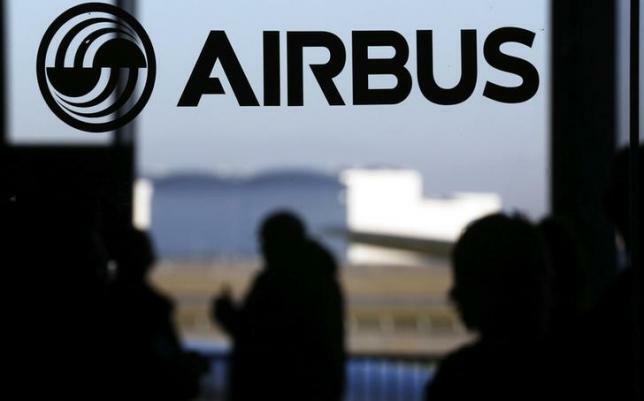 Just last week, Iran announced preliminary plans to buy 118 planes from France-based Airbus in a deal worth roughly $27 billion. Boeing, which is based in Chicago, says it isn't rushing to get back into Iran, says spokesman Gordon Johndroe. The nuclear sanctions have been lifted, and the sale of commercial aircraft are allowed. But the U.S. is keeping some sanctions against Iran in place that are linked to human rights issues and terrorism. Pilarski says Boeing would need to clarify a number of things before working out a deal. Boeing and Airbus compete fiercely around the world for airplane sales. But Pilarski says there's no need for Boeing to panic about getting beat to the punch in Iran. He says it's normal for a country buying aircraft to play two companies off each other for better price leverage in negotiations. Pilarski says it's likely Boeing is already quietly exploring a deal. "I would be very surprised if Iran only buys airplanes from Airbus and none from Boeing. That would be a huge surprise to me. It doesn't make sense," he says. Ardavan Amir-Aslani, a French-Iranian lawyer who is negotiating deals with Tehran for French companies says the Airbus deal isn't set in stone. Amir-Aslani says financing the Airbus deal is a challenge because it has to be done without using the U.S. financial system. U.S. banks are still barred from doing business in Iran, and most foreign banks have partnerships with U.S. banks. Amir-Aslani says there's a difference between announcing a deal with Airbus and having an actual contract in hand. "We're talking about memorandums of understanding or letters of intent. So the actual implementation of these contracts is going to happen over time," he says. Iran may have other more pressing needs for its money - from rebuilding its infrastructure to modernizing its oilfields. Richard Aboulafia, an analyst with the Teal Group, an aerospace consultancy, says Iran may decide to lease new planes, not buy them. He says losing a deal wouldn't affect Boeing too much. "I don't think this matters a whole heck of a lot. I mean you're talking about an industry that pumps out 1,400 jets a year," he says. Even if it doesn't sell planes, Boeing could make a lot of money another way. Many of those old jets that Iran is still flying are in desperate need of Boeing parts and maintenance, Aboulafia says. ALTAMONT, N.C. — A hiker who fell in the North Carolina mountains is safe after it took more than five hours and two helicopters to get him to a hospital in Asheville. Local media outlets report rescuers used a Blackhawk helicopter and then a medical helicopter to help the man, whose name was not released and who had fallen Saturday in the remote Linville Gorge Wilderness. The Blackhawk brought the hiker, who suffered a broken leg, off Shortoff Mountain. He was then transferred to a medical helicopter. The report of the fall was received about 11 a.m. but it took five hours before the hiker was rescued because of the remoteness of the area 60 miles northeast of Asheville. The hike to up Shortoff Mountain is a steep climb of about four miles. OCEAN BEACH — A man’s body was pulled from the waters off Sunset Cliffs after being spotted by the crew of a private helicopter Sunday morning, a San Diego lifeguard official said. The corpse was seen floating about a half a mile from shore near Osprey Street, and police were notified about 11:30 a.m., fire officials said. A police helicopter was sent to check on the claim, and, upon finding the body, lifeguards went to retrieve it. Lifeguards on shore used high-powered binoculars to locate the remains, and the corpse was taken to shore about 30 minutes later, said San Diego lifeguard Lt. Andy Lerma. The body was badly decomposed, and may have been in the water for days, if not weeks, he said. 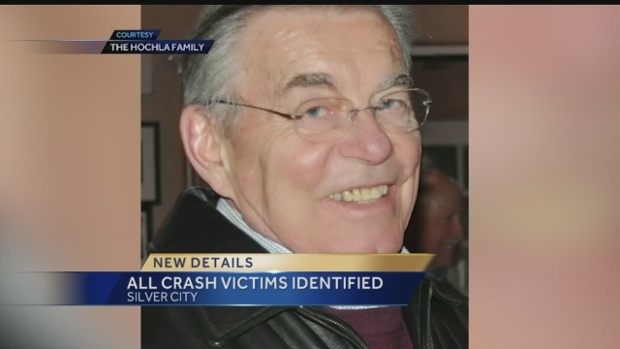 The Medical Examiner’s Office will determine the man’s identity. A plane from Dublin to Edinburgh was at the center of a terror scare after a passenger claimed people armed with knives were on board. The man who made the claim was hauled off the flight after passing a note containing the allegation to cabin crew. Staff on board the Aer Lingus flight at Dublin Airport contacted police who surrounded the plane on the runway before he was removed in front of shocked passengers. The Scottish Daily Record reports the captain announced the plane was being delayed because of the note. Sources at the airport later confirmed it contained the knifes threat but said the incident wasn’t being treated as terrorism. Passenger Peter Munro, from Edinburgh, posted on Twitter: “So a Garda SWAT team just pulled a guy off our Aer Lingus flight from Dublin to Edinburgh. A spokesperson for Aer Lingus said: “We can confirm there was a security incident at Dublin airport, on board Aer Lingus Regional flight EI 3258, operated by Stobart Air, en route from Dublin to Edinburgh. The 7.10pm was delayed for just under an hour and landed in Edinburgh at 8.41pm. A spokesman for the Dublin Garda police said: “At approximately 6.35pm, Gardaí were called to the scene of an incident on a plane at Dublin Airport. "A male passenger aged in his 20s was removed from the plane by Gardaí and detained under the Mental Health Act, he has since been admitted to hospital. Terry Phillips works on a airplane on Wednesday, Feb. 3, 2016, at Attitude Aviation at Huntington Tri-State Airport. HUNTINGTON - A proposal to strip the Federal Aviation Administration of its power over the country's air-traffic control system and transfer those duties to a private entity has members of some aviation organizations concerned about the economic effect such a measure would have on businesses, noncommercial airports and rural communities. Advocates of the proposal claim a private nonprofit or for-profit group controlling air traffic would generate a revenue stream to use for much-needed equipment upgrades. Those who oppose the plan say it would be disastrous for local economies, general aviation and for the companies who use small planes to conduct business on even a minor scale. The proposal was first brought to the forefront in June 2015 by U.S. Rep. Bill Shuster, R-Pa., during a speech to the Aeroclub of Washington. CNN reported Shuster told the group the country's current air-traffic control, or ATC, system uses "technology from the last century" and can't handle any more growth in the airline industry. Then, last Wednesday, Shuster introduced legislation in the House that would shift day-to-day air traffic operations from the FAA to a private, non-profit organization and transition from a radar-based traffic control system to one based on satellite technology. A board representing aviation system users would govern the new, federally chartered air traffic control corporation. The legislation calls for completing the transfer of responsibilities within three years. J.D. Smoot is president of the Tri-State Pilots Association, but was not speaking on its behalf. He was instead speaking as a private pilot who flies general aviation and said he would be greatly affected by user fees implemented for each takeoff and landing performed at an airport with a control tower, using air-traffic control services or receiving a preflight weather briefing that could be put in place if the ATC is privatized. "Both iterations of the FAA re-authorization as well as plans to privatize ATC that I have read do not include user fees for private aircraft yet," he said "I personally see this push for privatization as the camel's nose under the tent-type of situation. The airlines provide the lion's share of revenue and tax from which ATC services are funded. It's not too far-fetched to see airlines trying to transfer these costs to private aviation through user fees for general aviation in an effort to boost their bottom line." 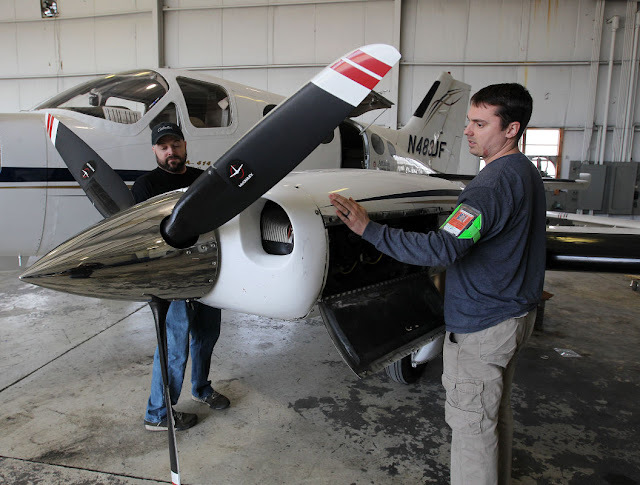 Jarrod Golice, right, and Dave Crum work on an airplane on Wednesday, Feb. 3, 2016, at Attitude Aviation at Huntington Tri-State Airport. During a conference call with The Herald-Dispatch, three aviation industry employees outlined why ATC privatization is not good for smaller airports, rural communities or businesses. Jerry Brienza, general manager of the Huntington Tri-State Airport and president of the West Virginia Airport Managers Association, said a user-fee system is already in place through the aviation fuel tax and that money is passed on to the FAA to pay for ATCs and fund airport improvement projects. "A third-party would have total authority to implement their own fees - whether for-profit or nonprofit - and would be generating their own taxes, which is problematic for airports like (Huntington)," Brienza said. "I'm not 100 percent opposed to some sort of a change in the future, but I haven't seen the facts yet that clearly state this is going to be a safer and more effective way to handle business. I have read every document about privatization, and there is no documentation that says this is the route we should be taking. I would caution Congress not to make any knee-jerk reactions and create an industry that is not as effective or safe as the one we currently have." In Huntington, fuel purchased at the airport for general and business aviation is its No. 1 revenue generator, Brienza said. General and business aviation, however, are also very volatile. "Fuel prices go up just a little bit, activity decreases a lot," Brienza said. "It takes a long time to get that activity back up. People sold planes two or three years ago when fuel prices were out of control and they could no longer afford to fly. Prices have dropped and those people aren't coming back. It's a domino effect. We not only make money on the fuel they purchase, but from hanger rentals and landing fees. If this activity decreases, so does our revenue. This is an industry that is very sensitive toward any increased costs. The only way to pay for a third-party system would be to either increase fuel tax or implement service fees. I don't see any positives until we come up with a plan, and I don't think there is a plan in place." Selena Shilad, executive director of the Alliance for Aviation Across America, said during the conference call a wide-scale survey conducted by PricewaterhouseCoopers called "Contribution of General Aviation to the U.S. Economy" shows general aviation contributes $1 billion to West Virginia's economy annually through the state's 17 general aviation airports, 1,806 pilots and 855 general aviation aircraft. The study also shows general aviation supports 5,300 jobs in West Virginia resulting in $256 million in income. According to the West Virginia Department of Transportation Aeronautics Commission, the state is also home to 21 Aerospace industry companies, 11 repair stations, one FAA-approved pilot school, 411 student pilots, 265 flight instructors and 26 fixed-based operators, or FBOs. Since whether ATC is privatized is a decision that Congress will make, opponents of the proposal have been busy writing to their elected officials in Washington. Huntington Mayor Steve Williams wrote a letter to U.S. Send. Joe Manchin, D-West Virginia, and Shelley Moore Capito, R-West Virginia, urging their support for business and general aviation, saying both are essential to the success of companies and communities of all sizes. "Across the country, individuals, entrepreneurs, use general aviation to fly from community airports, reach multiple plants and customers in a day, transport tools and supplies and reach far-off markets that are often otherwise inaccessible," Williams wrote. "These aircraft and these airports also connect rural communities with vital services such as medical care, emergency medical transport, fighting forest fires, law enforcement and search and rescue." Williams ended the letter by asking the Senators not to cede authority of ATC to a private entity. Dan Hubbard is senior vice president for communications at the Washington, D.C-based National Business Aviation Association, or NBAA, that provides more than 100 products and services to its 10,500 member companies. He said during the conference call NBAA members of all sizes from a variety of industries have one thing in common: they rely on the use of their own airplane to meet at least some of their business transportation needs. "Sometimes they need an airplane to get people to different facilities, sometimes they need it to move parts to fix machinery, sometimes they use it to reach three of four destinations in a day in particular out of small towns and rural areas to get to the bigger markets where the business opportunities are," he said. "Our members don't make their money by flying the airplane; it just helps them do their business." A common misconception, Hubbard said, is that it is only large companies that need and use airplanes. A majority of NBAA members are small and mid-size companies employing 100 or fewer people in small towns that are often the towns' employment anchors, he said. "Small airport access is really important because if it is restricted or goes away, a company may have to make the choice to leave that small town and move to a larger city so they can continue using their plane for business," he said. "These companies don't want to do that because the smaller airports are much easier for them to use because they don't have the congestion characteristic of the airline hubs. 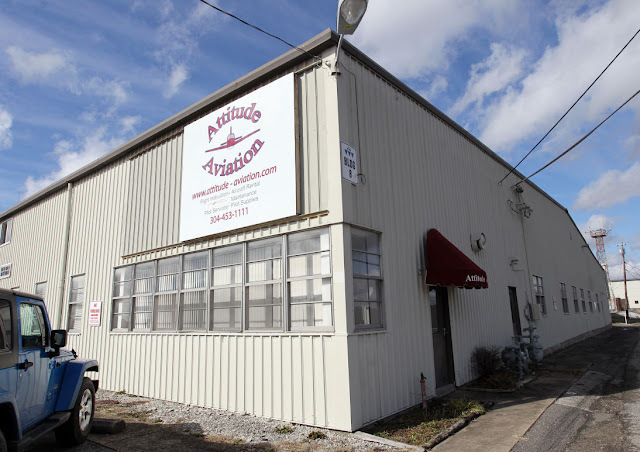 Attitude Aviation is located at 1433 Airport Road in Huntington. Of the 5,000-plus airports in America, about 500 are served by major airlines, Hubbard said. While most big airline executives have been ardent supporters of privatization and contend it will lead to faster equipment upgrades and more efficient flight patterns, Delta Airlines conducted a study that shows ticket prices could increase by as much as 29 percent as a result of privatization, money that would be passed on to create the private ATC organization. A comprehensive study by PricewaterhouseCoopers concluded that employment from general aviation totaled 1.1 million jobs in 2013. The national total annual economic contribution of general aviation is $219 billion, with additional economic affects from the 2,200 charter flight companies, 4,144 repair stations and 569 flight schools operating 4,653 aircraft. There are 3,330 fixed based operators, 18 "fractional" ownership providers and 261,806 airframe and power plant specialists. Nearly 600,000 pilots a vast majority - fly general aviation aircraft. A 2015 Harris Poll shows about 4 out of 5 business aviation flights are into an airport with infrequent or no scheduled airline service, or into a secondary airport. - About 2 in 5 flights involve multi-leg trips to more than one destination. According to the same study, passengers of these flights spend nearly two-thirds of their time on the aircraft on work-related tasks. 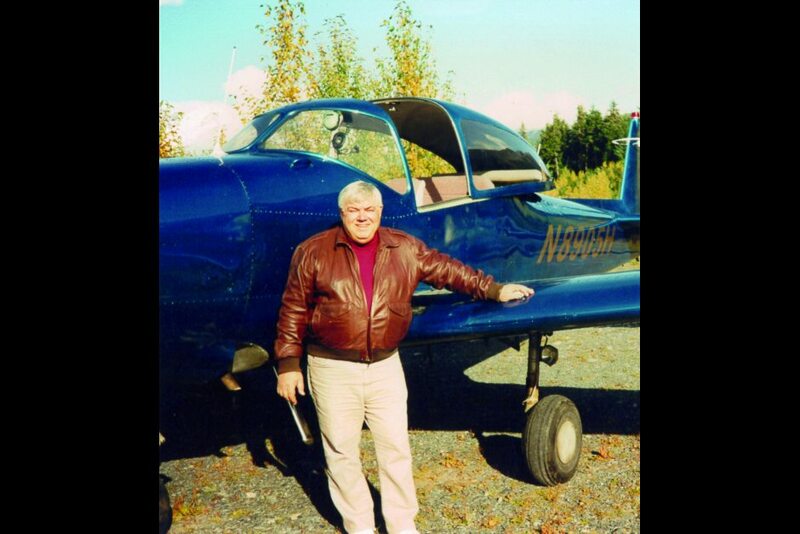 Chuck Sassara stands with a North American Navion in the early 2000s, approximately 2004. Said Sassara, "North American Navion: 260 horsepower. I owned five of these big old rocking chairs, which were a little slow but sturdy, all in all a nice roomy flying machine." On the second page of “Chuck Sassara’s Alaska,” the author slams his plane into the snow on the Anchorage side of Merrill Pass en route from Bethel. The incident, which occurred in 1976, left Sassara and his passenger unhurt but stranded for six days, unsure if they would be rescued. They got out, of course, as can be evidenced 40 years later by the publication of this book and Sassara’s relentless promotional schedule. A longtime Alaskan who showed up here in the 1950s and made a name for himself as a pilot and airplane dealer -- as well as a member of the state Legislature -- this self-published memoir is a bit rickety at times, but there’s plenty of fun to be had reading it. Sassara’s adventurous spirit appears genetic. As he explains in the early pages, his father was an orphan who stowed away to Europe as a child then headed for South America in his teens. Sassara’s mother took to her husband’s wayward lifestyle as well, and the author grew up traveling. The family lived in the Panama at one point and moved about the U.S., too. After high school, he worked and studied in California, where he met his soon-to-be wife, Ann. In 1955, the couple decamped to Alaska, driving a Volkswagen Bus up the Alaska Highway at a time when the road north was a potholed mess. They arrived in Anchorage, where Sassara took a job as a gopher for Pacific Northern Airlines. Given his upbringing, it’s not surprising Sassara found his spiritual calling in the air and his professional direction in self-employment. Within a short time, he was running a business near Merrill Field, buying and selling cars, trucks and planes while bush piloting out of the same office. Meanwhile, he and his wayward parents, who had traveled north with him, purchased a lodge on Big Lake -- at that time still a fairly remote spot. A good part of this book centers on the latter part of Alaska’s territorial period as well as the early years of statehood, a time when there were far fewer people, not a lot of rules, and things were often accomplished through seat-of-the-pants methods. There are some great stories about remote flights and the severely rustic conditions many Alaskans welcomed. The subtitle of this book is “Propellers, Politics & People,” which more or less summarizes the order of attention Sassara gives to his main themes. This is first and foremost a pilot’s memoir, and the lion’s share of it is given over to his love of airplanes. People, meanwhile, garner more space than politics. Sassara offers sketches of many who passed through his life, from the obscure to the well known. Among the obscure is his friend Jimmy Burns, a fellow pilot damned with perpetual bad luck. The stories of his mishaps and near-misses are quite funny, although the laughter ends when his bad luck finally prevails. At the other end of the spectrum is former U.S. Sen. Ted Stevens, with whom Sassara served in the Alaska Legislature during the 1960s. While from opposing parties, the two shared the bond of being in Alaska at a time when working for the common good was valued above partisan loyalties. They became close friends. Politics get the shortest play here, and that’s a shame. Sassara spent several years in the Legislature during the 1960s, and his observations of the time would be valuable for those interested in Alaska’s political history. His firsthand knowledge of how issues were resolved during that era would be interesting to read about now. He should consider revisiting this period through articles or blog posts, especially given Alaska’s current dire fiscal situation, which mirrors the state’s early days. The latter part of the book speeds through the '70s and beyond. The highlight is a chapter about his son Charlie’s winter ascent of Denali. Charlie Sassara is world-renowned climber and that trip turned tragic. The account gives readers cause to sympathize with Sassara’s late wife, Ann. With a bush pilot husband and a mountain-climbing son, she must have endured many sleepless nights. She was no slouch herself, though. Sassara writes, “She was at ease carrying her own custom-made 30.06 high powered rifle looking for a moose to plug, or a bear to chase off the porch. This woman was always ready for an adventure.” As Sassara notes, it was a long way from the streets of Hollywood, where she spent her youth. The two were married 58 years before she died. As a self-published work “Chuck Sassara’s Alaska” jumps around a bit, but it could be argued that the wrong editor would have toned down the author's voice, and that’s part of this book’s charm. He’s pretty colorful and funny with his descriptions. At one point he mentions seagulls, “always ready to open their bomb-bay doors and drop a load of excrement on the people below.” Elsewhere he dismisses the Stinson L5 because its “useful load was limited to 325 pounds, which amounted to a fat pilot and about six gallons of fuel.” Lines like this fly off the pages. Chapters of the book are like tales told over beers. Unlike many self-published writers, Sassara has taken the time to edit his text carefully, so the misspellings and grammatical disasters often endemic to such works are absent. In an age when even major publishing houses issue books littered with errors, this is appreciated. For Alaska aviation junkies, “Chuck Sassara’s Alaska” is a must, and for casual readers there’s plenty here as well. This one kept me up past my bedtime thinking, “Just a couple more pages,” and suddenly I was finished and wondering how it got so late. WOW air, the Iceland-based airline, has purchased two new Airbus A321-211 airplanes. The two new planes are a part of the airline's expansion in the North-American market that is set to commence in May. The company will take delivery of the planes later this month. With this latest addition the WOW fleet now counts ten airplanes, four of which are owned by the airline. The purchase price was 30 billion Icelandic krona (ISK), approximately $275 million USD, with a ten year lease agreement financed by a foreign financial institution. "We are doubling our seat inventory this year and it is great to be able to offer our passengers the newest airplane fleet in Iceland. The Airbus has been a great plane for us and are a very good choice for our route network. 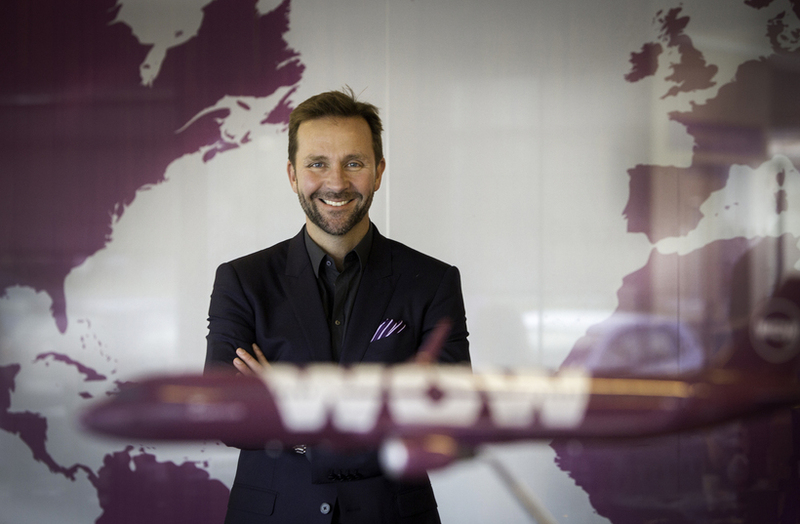 During the financing of the planes, it was a pleasure to see how much trust WOW air enjoys in international markets," said Skúli Mogensen, founder and CEO of WOW air. According to WOW air, the seats in the A321 are an inch wider than seats in Boeing 757. Although this type of an airplane can be fitted with 230 seats, WOW air will the A321 fitted with 200 seats, providing passengers with more legroom. Ella Myers’ parents, Jennifer Douglass, right, and Brian Myers mounted an exhibit of Ella’s photographs and writings at Western New Mexico University that will travel the state this year. From left, Michael Mahl, Ella Kirk and Ella Myers, students at Aldo Leopold Charter School in Silver City. They died in an airplane crash in May 2014. In addition to her literary pursuits, Ella Kirk, 14, was actively fighting the state's plans to divert water from the Gila River. 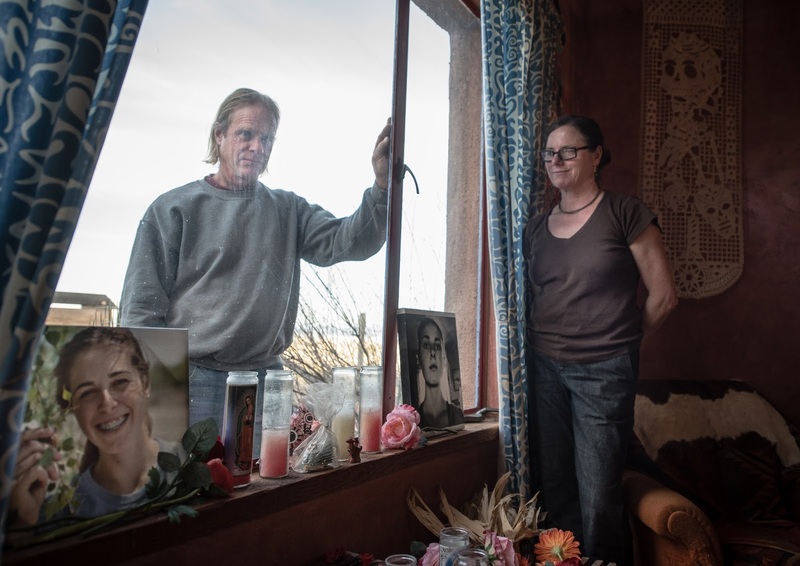 John and Jennifer Mahl and their son Alex Mahl are the parents and brother of Michael Mahl, one of the teens who perished along with two other students in a plane crash after flying to look at damage from a forest fire. I see it every night in every dream, so I don’t know what is my dream, and I don’t know what is reality, because it’s different. Sometimes it’s a fireball, sometimes it’s not. 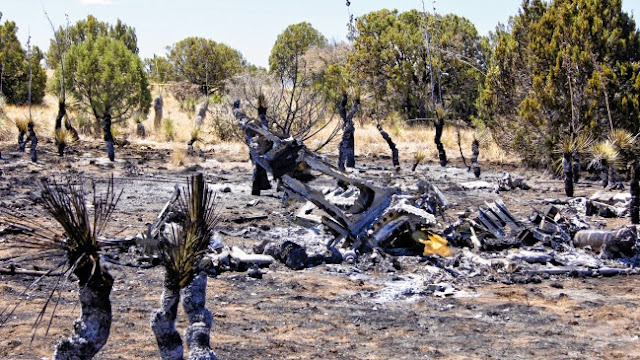 Two years ago in May, a small plane flying three teenagers over the Gila National Forest for a school-related project crashed and burned a mile from the airport where it should have landed, killing everyone on board. 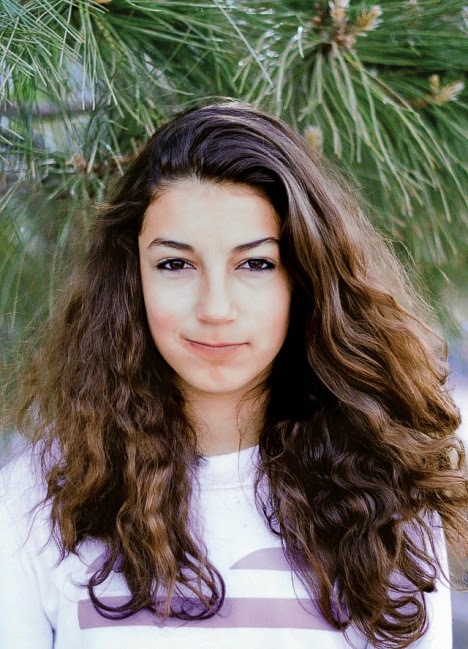 Ella Kirk, 14: writer of poetry, prose and song. Michael Mahl, 16: musician, devoted Christian, irreverent funnyman and student body president. Ella Myers, 16: photographer, equestrian, budding novelist and aspiring filmmaker. All three were avid conservationists. And Peter Hochla, 67: a retired Albuquerque psychiatrist and pilot who flew around the state providing mental health care to veterans and inmates in rural areas. Last month, the school settled the claims for a total of $750,000 – the maximum payout allowed in lawsuits involving a school under state law. The terms of the settlement with the Hochla estate were not disclosed. The tragedy – and the response – deeply divided a small town where both the kids and the school were beloved. Accident reviews by the National Transportation Safety Board and an outside flight expert attributed the crash to a combination of pilot error in handling a “slippery” aircraft that could require delicate maneuvering and the exacerbating factor of weather, particularly wind gusts. Steve Blake, the teacher who arranged the flight and who, according to depositions in the lawsuit, failed to inform the school administration or review the pilot’s experience, was not formally disciplined until the settlement forced a letter of reprimand. Blake, a co-founder of Aldo Leopold in 2005, resigned from the school last year. The settlement required the Aldo Leopold Governing Council and Principal Eric Ahner to acknowledge the administration’s responsibility in the accident and issue a formal apology. The school was also made to hire an outside risk assessor to evaluate decision-making processes and practices in “experiential” education. 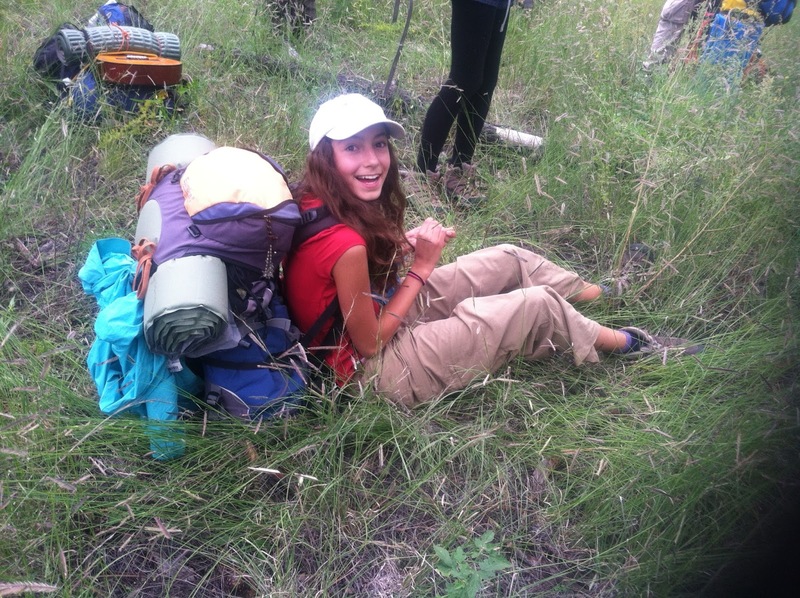 An “experiential” education favors field work, and parents say that is part of what sets Aldo Leopold apart. Backpacking trips into the Gila wilderness, internships and service projects are all part of the Aldo Leopold program. 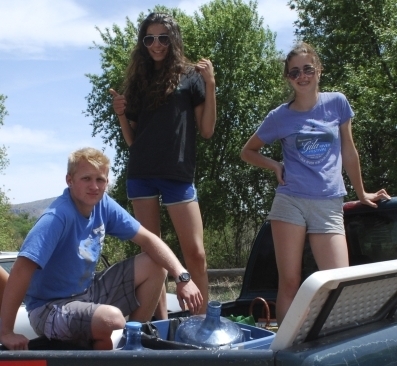 On May 23, 2014, Kirk, Mahl and Myers were eager to do research for an ecomonitoring project as part of their participation in the school-mandated Youth Conservation Corps. 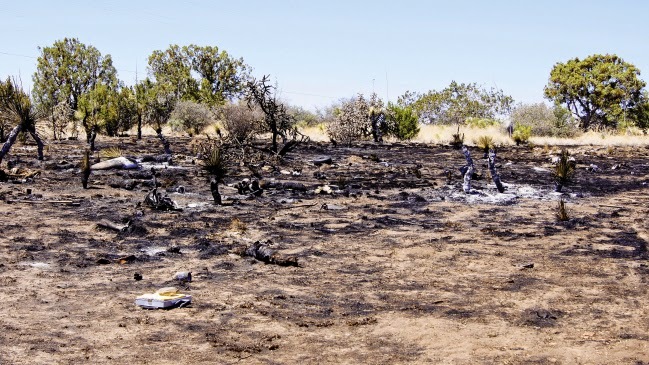 A forest fire had burned Signal Peak in the Gila just a few weeks before. Blake arranged a flyover of the burn area for the kids to survey the damage. And she got on my lap, and she gave me a great big hug, and she said, ‘Everything’s going to be okay,’ and then she went pedaling off. On Fridays, Hochla often flew to Silver City to see patients. Blake’s wife, Denise, who was a nurse and a colleague of Hochla’s, would pick him up at the airport. Sometimes, when the weather was bad, he would stay the night at the Blake residence. Hochla was an experienced airman, having served in the New Mexico Air National Guard at Kirtland Air Force Base for 21 years, according to his obituary in this newspaper. That Friday in May, when the students were looking for a way to survey the damage of the Signal fire, the idea was proposed that Hochla take the kids on a quick flyover of the zone, departing and landing at Whiskey Creek Airport off Highway 180 near town. The parents signed permission slips with the understanding that, if the weather turned, the flight would be canceled, according to interviews. Storm clouds were skirting the area, and gusty winds picked up in the afternoon. Patrice Mutchnick, mother of Ella Kirk, said in a deposition that she assumed the trip would be called off. But Hochla’s Beechcraft Model G36 Bonanza departed from Whiskey Creek between 3 and 3:30 p.m. with Kirk, Mahl and Myers on board. Shortly before 4 p.m., according to reports by Lewis and the NTSB, the plane approached the runway too fast. Winds gusting to around 25 knots exceeded the plane’s maximum crosswind limit of 17 knots. The plane touched down briefly, skipped, then touched down again before Hochla – with too little runway left to stop the aircraft – attempted to take off again, applying full engine power. But, according to the expert’s report, the airspeed was now too slow to accelerate back to a safe flying speed. One wing stalled. The plane began to roll. Some (people) have a light that radiates from their eyes. A light only death can diminish. These are the hardest to let go … You hold them there and try not to move, try to scarcely breathe because you know with only one faint puff their flesh and blood and skin will crumble and dissolve into nothing but dust in the sunlight. You hold this individual for as long as you can, you hold your breath till you can hold it no longer. The parents are trying to honor their children in personal ways. 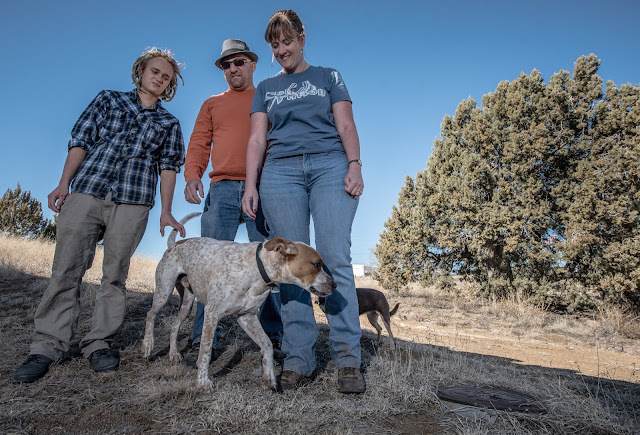 Brian Myers and Jennifer Douglass, parents of Ella Myers, mounted an exhibit of her photographs and writings that opened at Western New Mexico University in January and will travel the state this year. Myers and Douglass may also set up a foundation that would fund projects that combine art, science and the environment – “because that was the direction Ella was going in her work,” Douglass said. Myers had written two novels that won national awards, and she had earned a merit scholarship to study filmmaking at a summer program of the prestigious School of the Art Institute of Chicago. Her mother, who runs a horse farm, said she was also an accomplished dressage rider. 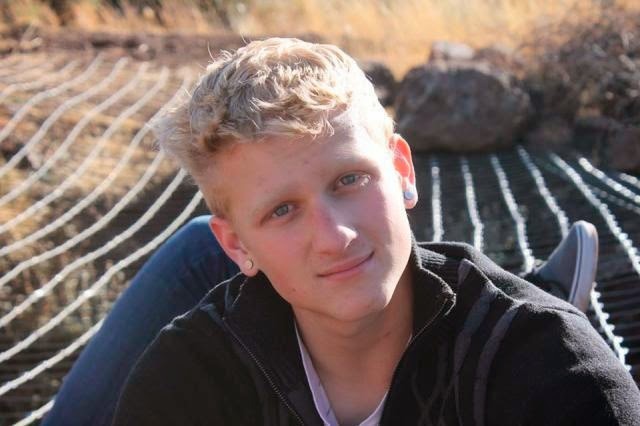 The Mahl family is working to set up a scholarship in Michael Mahl’s name at WNMU. Mahl played guitar, drums, ukulele, mandolin and an aboriginal wind instrument called the didgeridoo – which he built himself. Ella Kirk – in addition to her literary and musical pursuits – was actively fighting the state’s plans to divert water from the Gila River. She delivered a 2,500-signature petition to the Interstate Stream Commission and a 6,400-signature petition to Gov. Susana Martinez to keep the Gila running free. The settlement attempted to end an argument over whether the flight counted as a “school trip.” The administration said that in part because the flight took place three days after the last day of school, it was not sponsored by the school. In their lawsuit, the parents claimed that regardless of whether class was in session, their kids were doing ecomonitoring that furthered the goals of their Youth Conservation Corps project. However, he qualified that statement by adding it was not a “school-sponsored” trip that would have triggered the school’s usual safety protocol. John Mahl said his youngest son still attends Aldo Leopold. 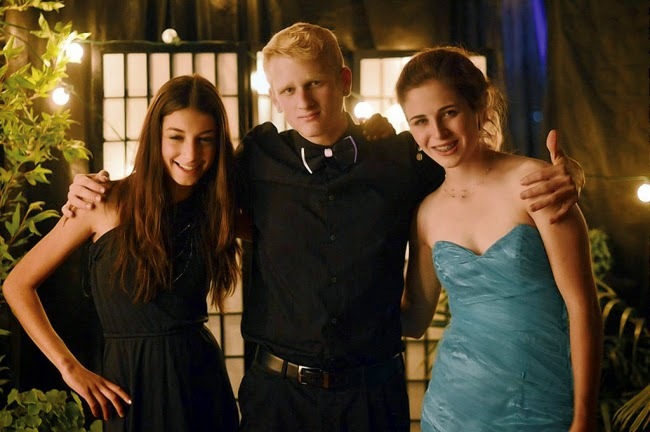 From left to right: Ella Kirk, Michael Mahl and Ella Myers. The airplane was returning from a local flight and the pilot flew a tight downwind leg for landing on runway 35, possibly due to a direct crosswind in excess of 20 knots. During the base turn, the airplane overshot the final course, and the pilot used at least 60 degrees of bank to correct the airplane back on course and over the runway. The airplane then bounced and touched down at least 20 knots above the manufacturer’s published approach speed with about 1,810 ft remaining on the runway. The airplane’s airspeed began to rapidly decrease, but then several seconds later, the airplane’s airspeed increased as the pilot rejected the landing. The airplane did not gain significant altitude or airspeed then began a slight right turn. The airplane’s roll rate then sharply increased, and the airplane quickly descended, consistent with a stall, before colliding with a transmission wire and terrain. Examination of the airframe and engine did not reveal any preimpact anomalies that would have precluded normal operation. Strong, variable, gusty wind, with an environment conductive to the formation of dry microbursts, was present at the airport at the time of the accident. Several lightning strikes were recorded in the vicinity of the accident site around the time of the accident. It is unknown if the presence of lightning or wind impacted the pilot’s inflight decision-making in the pattern, on approach, or during the attempted go-around. The circumstances of the accident are consistent with an in-flight encounter with a strong tailwind and/or windshear during climbout after the rejected landing. An autopsy conducted on the pilot identified significant stenosis of a distal coronary artery without any other evidence of cardiac distress; however, if there was an associated medical event, the condition would likely result in sudden incapacitation, which is not consistent with the airplane’s coordinated flight profile. The airplane’s encounter with a strong tailwind and/or windshear, which resulted in an inadvertent stall. Contributing to the accident was the pilot’s continuation of the unstable approach, long landing, and delayed decision to conduct a go-around. On May 23, 2014, at 1553 mountain daylight time, a Raytheon G36 airplane, N536G, impacted terrain near Silver City, New Mexico. 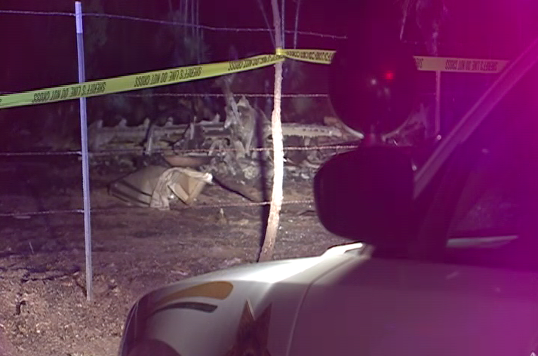 The private pilot and three passengers were fatally injured. The airplane was destroyed. The airplane was registered to Rural Health Outreach Inc. and operated by the pilot under the provisions of 14 Code of Federal Regulations Part 91 as a personal flight. Visual meteorological conditions prevailed for the flight that operated without a flight plan. The local flight originated from the Whiskey Creek Airport (94E), Silver City, New Mexico, at 1536. Several witnesses at 94E saw the airplane just prior to the accident. One witness at 94E saw the airplane in the pattern for runway 35. He noted that the airplane's position on downwind was "tight" in relation to the airport. The airplane began a "very tight base leg that was at least a 60 degree bank." The witness described the winds as gusty, around 25-30 knots, as would be associated with the passage of a thunderstorm. The airplane tightened the base to final turn and overshot the final approach leg. The witness estimated that the airplane's first touchdown occurred near mid-field, where it bounced and then settled to the runway. Shortly thereafter, the engine sounded as if the pilot had applied full engine power. The airplane was seen travelling down the runway and then took off. The airplane's landing gear and flaps appeared to both be down. The airplane began gaining altitude and started a slight right turn. The witness said that the airplane stalled and descended out of sight. Another witness observed the airplane in a "tight left downwind approach for runway 35 at about 600-800" feet above ground level. The airplane's groundspeed increased in the base turn and the airplane flew through the runway's extended centerline. The airplane used at least 60 degrees of bank to correct back towards the runway's centerline. The airplane landed and then attempted to go around. The airplane went off the end of the runway at a high angle of attack, descended slightly into the valley, and then began to gain altitude. The airplane started a 15° bank turn to the east, began to descend, and the airplane's angle of attack got "steeper" as the airplane descended out of sight. A witness near the accident site saw the airplane "gradually roll to the right, and then "sharply pitch" to the right where it impacted the ground." 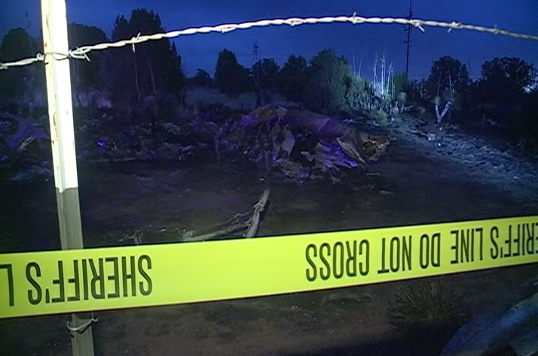 The airplane impacted desert terrain near several trailer homes. 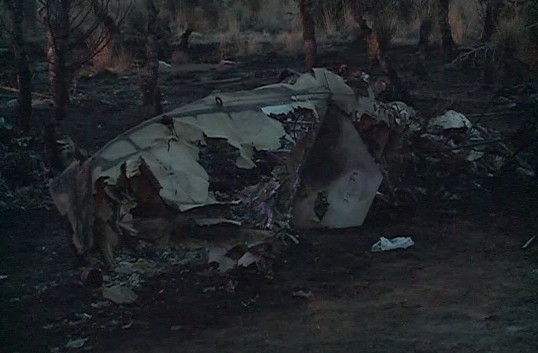 A post impact fire ensued and consumed a majority of the airplane. The pilot, age 67, held a private pilot certificate with ratings for airplane single engine land and instrument airplane. The pilot flew his airplane frequently to treat patients at remote medical clinics. A review of the pilot's log book found that the last completed page ended on March 14, 2014. As of that date, the pilot logged a total of 3,547.7 hours. The preceding log book entries indicated that the pilot flew on average 15 hours per month, so the pilot's total flight time was about 3,600 hours prior to the accident. The pilot's flight review, which included an instrument proficiency check, was completed on December 16, 2012, in the accident airplane. On January 29, 2014, the pilot was issued a second class medical certificate with the restrictions that the pilot must wear corrective lenses for near and distant vision. The medical examination also noted mild cataracts and his retina showed no holes, tears, or retinal detachment. The single engine, low wing, six-seat, retractable gear airplane, serial number E-3707, was manufactured in 2006. It was powered by a single 300-horsepower Continental Motors IO-550-B engine, serial number 675766, that drove a metal Hartzell three bladed, variable pitch propeller. The airplane's last inspection was an annual type accomplished on June 6, 2013, at an airframe total time of 1,105.8 hours. On October 3, 2013, the engine was overhauled and modified by a supplemental type certificate. The overhauled engine was installed in the airplane on November 1, 2013 at a total airframe time of 1,156.1 hours. The most recent hour meter recorded in the logbooks was for maintenance performed on April 8, 2014, at a total airframe time of 1,229.4 hours. At 1555, an automated weather reporting station located at the Grant Country Airport (KSVC), located about 8.75 nautical miles southeast of the accident site reported wind from 270 degrees at 21 knots gusting to 28 knots, visibility 10 miles, ceiling broken at 10,000 feet, temperature 70 degrees Fahrenheit (F), dew point 34 degrees F, and a barometric pressure of 30.04 inches of mercury. A weather study was conducted for the accident area. Atmosphere data retrieved from a weather balloon launch at 1800 from Santa Teresa, New Mexico, identified an environment conducive to "dry microbursts." This area had a potential for severe weather gusts of 68 knots and microburst gust potential of 50 knots. Weather radar data identified patterns consistent with developing and decaying convective activity in the vicinity of the accident site near the time of the accident. Some storm cell decay occurred south of the accident location with 10-15 minutes prior to the accident. In addition, from 1539-1555, several lightning strikes were detected within 10 miles of the accident site. The Whiskey Creek Airport (94E) is a public airport located at measured altitude of 6,126 feet mean sea level. It has one runway 17/35, 5,400 feet by 50 feet, of asphalt construction in good condition. 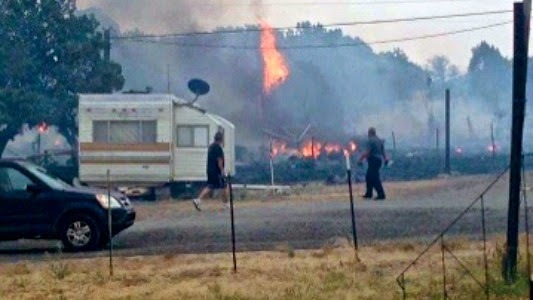 The airplane impacted desert terrain near several trailer homes, about 0.8 miles northeast of runway 35's departure end. 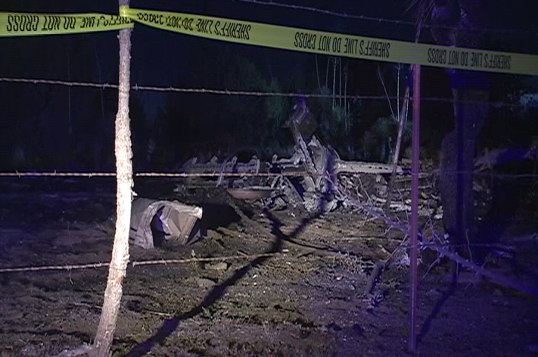 The airplane's first impact point was a transmission wire located west of the accident site about 25 feet above the ground. Forty feet east of the transmission wire was a ground crater which contained the airplane's propeller. The debris path was roughly cone shaped, was aligned on a 77° magnetic heading, and was about 140 feet long and 70 feet at its widest area. 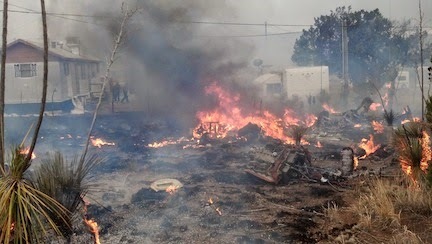 A postimpact fire ensued which consumed a majority of the airplane. 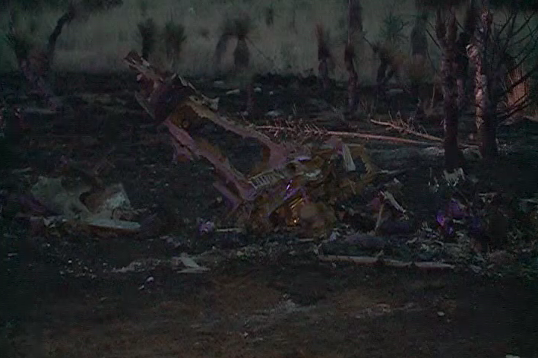 The main wreckage contained remnants of the cabin, fuselage, wings, and empennage. The wreckage came to rest facing a 228° heading. Both ailerons were partially consumed by the postimpact fire and remnants remained attached to their respective wing. The left aileron trim actuator extension was measured and found to be about 1.75 inches, which corresponded to about 7° trim tab trailing edge down. Aileron control continuity was established from the flight controls to each wing bell crank. Aileron trim control cable continuity was confirmed from the cockpit to the aileron trim actuator. The flaps actuator indicated the flaps were up. The left and right elevator flight control surfaces were partially consumed by the postimpact fire. Remnants of the elevators remained attached to their respective horizontal stabilizer. The left and right elevator trim actuator extensions were measured and found to be 1.625 inches, which corresponded between 10-15° trim tab trailing edge down, airplane nose up. Elevator control continuity was confirmed from the cockpit to the elevator surfaces. The elevator trim control cables were confirmed from the cockpit to the trim actuators. 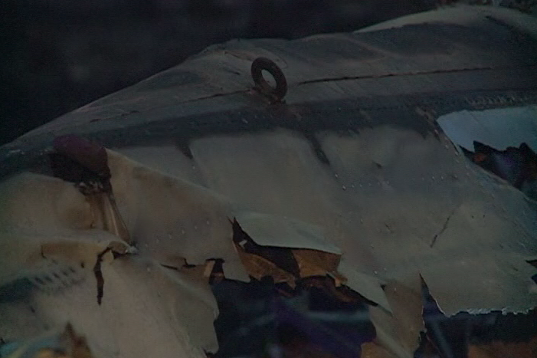 The rudder was partially consumed by the postimpact fire and remnants remained attached to the vertical stabilizer. Rudder control continuity was established from the cockpit to the rudder bell crank. The gear handle was found in the down position. The fuel selector was found selecting the right main tank. No preimpact anomalies were detected with the airframe. The engine was impacted damaged and found separated from the airframe. Both magnetos were actuated by hand and found to produce a spark at each terminal. The fuel manifold valve screen was clear of debris and all fuel nozzles were found clear of blockages. The throttle body and fuel metering unit's fuel screen contained a small amount of fibrous material but was largely unobstructed. The crankshaft was able to be turned by hand with continuity established throughout the engine. Cylinder thumb compression and suction was confirmed to each cylinder. A borescope inspection of each cylinder found normal operation and combustion signatures. No preimpact anomalies were detected with the engine. The propeller blades were labelled "A", "B", and "C" for documentation purposes only. All three blades displayed signatures of chordwise scratches, leading edge nicks and gouges, and blade polishing. Blade B was curled near the tip and the tip of the blade was found separated. Blade C displayed S-bending along its entire length. A Garmin Oregon 450t hand held GPS was found in the debris field and was sent to the NTSB laboratories for a data download. 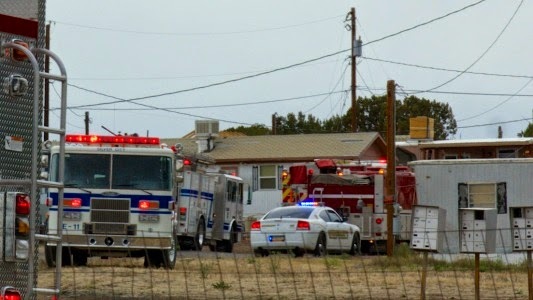 An autopsy was authorized and conducted on the pilot by the New Mexico Office of the Medical Investigator. The cause of death was the result of multiple blunt trauma and the manner of death was ruled an accident. The autopsy identified 80% stenosis of the distal third left anterior descending coronary artery. All other arteries were free of stenosis. Forensic toxicology was performed on specimens from the pilot by the FAA Bioaeronautical Sciences Research Laboratory, Oklahoma City, Oklahoma. Testing detected the presence of oxymetazonline which is a decongestant used in the treatment of nasal congestion. Beechcraft's Model G36 Bonanza Pilot's Operating Handbook (POH), revised July 2014, listed the maximum demonstrated crosswind limit as 17 knots. Published landing performance data for the airplane is predicated on a threshold speed between 78-81 knots depending on the airplane's weight. Published performance data does not exist for landings in excess of the published approach speeds or in excess of 10 knots of tailwind. Using a gross weight of 3,400 pounds, a direct crosswind of 20 knots, 70° F, and an approach speed of 80 knots, engineers from Textron Aviation estimated the required landing distance at 1,720 feet. The POH provided a chart of stall speeds with idle power. The chart was run for the airplane's final configuration of flaps up and airplane gross weights between 2,800-3,600 pounds. The stall speed at 30° of bank would be between 66-72 knots. The Garmin Oregon 450t is a battery operated hand-portable GPS receiver with a 12 channel wide area augmentation system (WAAS). The unit contains an electronic compass and a barometric pressure sensor for recording pressure-based altitude information. Published GPS position location accuracy is less than 33 feet horizontal under normal conditions, and 10-16 feet with differential global positioning system (DGPS) active. Although the device was thermally damaged, the airplane's last flight track was extracted. For the accident flight, the device was powered on at 1401 and recorded the airplane's takeoff time of 1536 as the flight departed on runway 17. The airplane turned to the north and flew about 13 miles north in an area between Black Peak and New Mexico Highway 15. The airplane then returned back to 94E and entered a left base turn for runway 35. Starting at 1551, the GPS update rate began to vary and there were two episodes of where the GPS receiver momentarily lost satellite lock and continued to record position information based on projected data. About 1552:15, as the airplane turned left towards the runway, the receiver lost satellite lock and the airplane's position returned at 1552:42 as the airplane was over the runway. At that time, the airplane was about 770 feet down the runway and 175 feet above ground level. At 1552:53, the airplane touched down with a groundspeed of 120 knots, skipped, and touched down 3 seconds later at 100 knots groundspeed with about 1,810 feet remaining on the runway. The airplane slowed to 87 knots and with 1,060 feet remaining on the runway the airplane's groundspeed began to increase. The airplane lifted off from the runway, flew to the north, and began a slight climb. At 1553:12, the airplane began to turn right at a rate of about 3-4° per second. About 1553:26, the receiver again lost satellite lock and regained the airplane's position about 30 seconds later at the accident site. The final portion of the accident sequence was not captured by the device. An Apple iPhone was located in the airplane's wreckage and shipped to the NTSB laboratories for download. Data extracted from the iPhone showed that none of the video files were date/time stamped on the day of the accident. Thirty eight of the image files were date/time stamped on the day of the accident. Most of these files depicted persons and aircraft on the ground. Ten of these files corresponded with previews or full resolution images of the view off the right wing from inside an aircraft in-flight. The file containing the most recent image was taken at 15:46:35 MDT. There was no data which could aid in reconstructing in accident sequence. 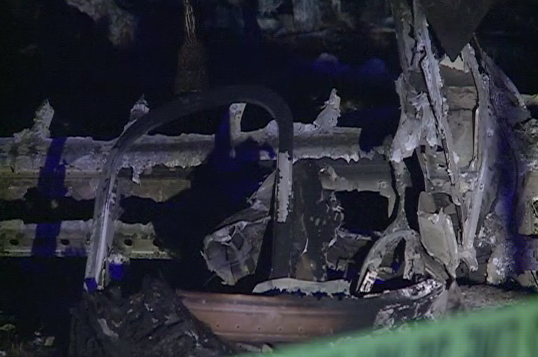 An SD card was found in a thermally damaged camera in the airplane's wreckage. 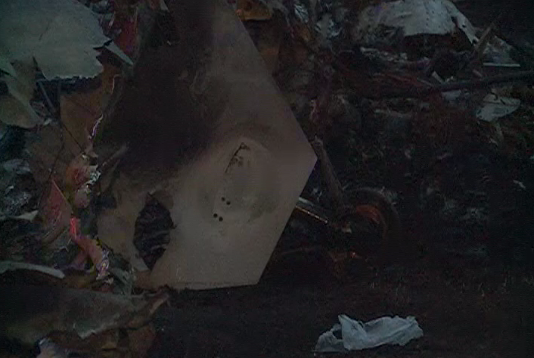 The SD card was extracted from the camera and shipped to the NTSB laboratories for download. Data extracted from the SD card found that two of the video files were date/time stamped on the day of the accident. Twenty of the image files were date/time stamped on the day of the accident. All of the image files corresponded with external views of an airplane on the ground or in-flight views looking forward or off the right wing. The most recent image was time stamped 1546 MDT. The two video files depicted in-flight views looking forward or off the right wing from an airplane in level flight. There was no data which could aid in reconstructing in accident sequence.